Inspired by this bike skirt, actually. Built on the circular centre of this granny square pattern (a really lovely pattern, by the way). Somehow managed to make only half of it, and then added more rows around it, while gradually morphing it into a rectangular shape to make the shirt. 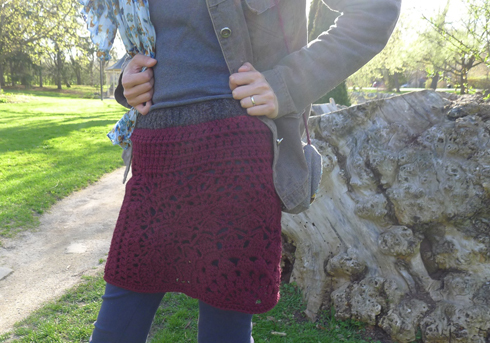 It was a pretty free‐formed process, which is really my favourite way to crochet, so I’m quite proud of this skirt. The half circle is centred on the side and the rest of the skirt are just made of dc and hdc rows. 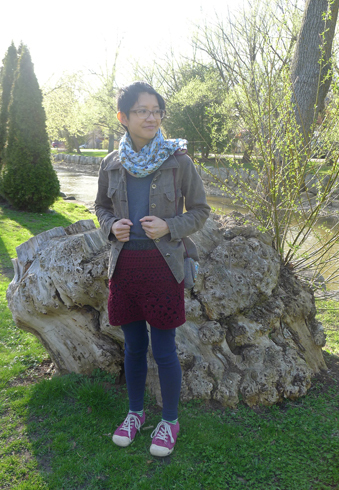 Had just enough wine‐coloured yarn to make the skirt part, so I decided to use a charcoal grey for the waist band, which was knitted on with a 1x1 ribbing.